Panforte is an Italian classic. A rich fruit and nut cake that makes the perfect accompaniment to coffee or served as a decadent dessert. Panforte is best made the day before as it is easier to cut when it hardens. Store in an airtight container. Preheat the oven to 150°C. Line a 20cm round baking pan with baking paper, and grease the sides with butter. Place the nuts, mixed peel, figs, apricots and chocolate into a large mixing bowl. Mix the flours, cocoa and all the spices in a bowl and sprinkle this over the nut mixture. Mix well until combined. Set aside. Place the honey, sugar and butter into a small saucepan. Stir over a medium heat until the sugar has dissolved. When the syrup starts bubbling, pour it over the nut and flour mixture and stir until thoroughly combined. You need to work quickly as the mixture will become very stiff as it starts to cool. Place the mixture in the prepared pan and, using wet fingers (careful as it might be hot), try to flatten the surface as much as possible. Bake the panforte for about 30 minutes or until the mixture is just bubbling in the middle of the pan. Take it out of the oven and leave it to cool in the baking pan – it will harden when cold. 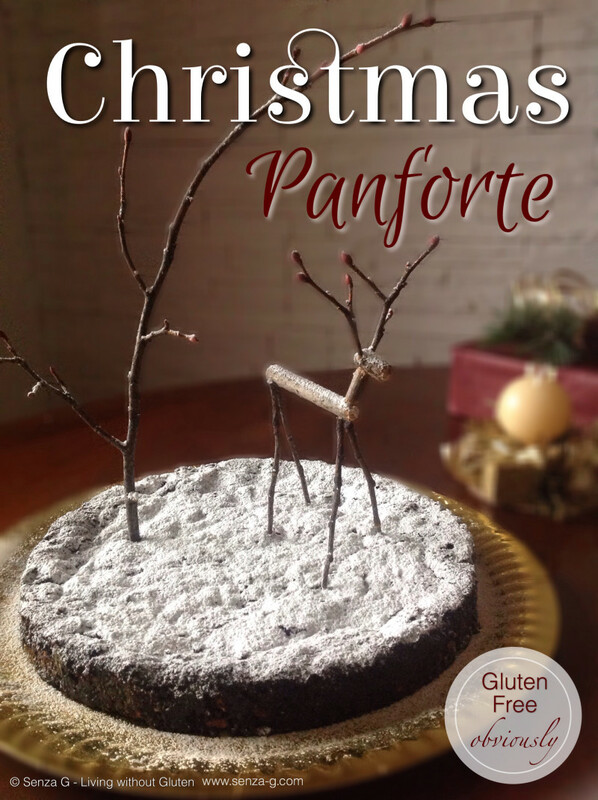 Remove the panforte from the pan and dust the top with the icing sugar. Decorate the top with some Christmas accessories if desired. I decorated mine with a homemade twig reindeer.